1983 Iceland bans all types of asbestos (with exceptions); updated in 1996. 1984 Norway bans all types of asbestos (with exceptions); updated in 1991. 1986 Denmark bans chrysotile (with exceptions). Sweden introduces the first of a series of bans (with exceptions) on various uses of chrysotile. 1989 Switzerland bans crocidolite, amosite, and chrysotile (with exceptions). 1990 Austria bans chrysotile (with exceptions). 1992 Italy bans chrysotile (with exceptions until 1994). 1993 Finland bans chrysotile (with exceptions). Germany bans chrysotile (with exceptions until 2011). Croatia bans crocidolite and amosite; updated in 2006 to include all types of asbestos, although that decision was overturned six weeks later. 1994 Brunei implements administrative rules on asbestos. 1995 Japan bans crocidolite and amosite. Kuwait bans all types of asbestos. 1996 France bans chrysotile (with exceptions). Slovenia bans production of asbestos-cement products. Bahrain bans all types of asbestos. 1997 Poland bans the production and use of asbestos products. Monaco bans the use of asbestos in all building materials. 1998 Belgium bans chrysotile (with exceptions). Saudi Arabia bans all types of asbestos. 1999 United Kingdom bans chrysotile (with exceptions). 2000 Ireland bans chrysotile (with exceptions). Argentina bans amphiboles; updated in 2001 to ban chrysotile. 2001 Latvia bans new uses of asbestos; installed asbestos products must be labeled. The first in an eventual series of Brazilian states ban asbestos. Chile bans all types of asbestos. Oman bans amosite and crocidolite; updated in 2008 to include chrysotile. 2002 Spain bans chrysotile, crocidolite, and amosite. Luxembourg bans chrysotile, crocidolite, and amosite. The Slovak Republic bans all types of asbestos. New Zealand bans the import of raw asbestos (import of asbestos-containing materials and secondhand asbestos products still allowed). Uruguay bans all types of asbestos. 2004 Honduras bans all types of asbestos (with exceptions). South Africa announces a phase-out of chrysotile over the next three to five years. Japan bans the new use of chrysotile in building and friction materials. 2005 Bulgaria bans all types of asbestos. Cyprus, the Czech Republic, Estonia, Greece, Hungary, Lithuania, Malta, Portugal, Romania, and Slovakia pledge to prohibit the new use of chrysotile, other forms of asbestos having been banned previously, under European Union rules. Japan announces a ban on all types of asbestos within three years. Egypt bans all types of asbestos. Jordan bans amosite and crocidolite; updated in 2006 to include all types of asbestos. 2007 New Caledonia bans all types of asbestos. 2008 South Africa bans all types of asbestos. Taiwan bans the use of asbestos in construction materials; updated in 2010 to include virtually all remaining uses of asbestos. 2009 Republic of Korea (South Korea) bans all types of asbestos. 2010 Qatar “strictly prohibits” the import of asbestos. 1. International Ban Asbestos Secretariat. Chronology of National Asbestos Bans. Revised 8 March 2010. Comp. Laurie Kazan-Allen. London:International Ban Asbestos Secretariat. Available: http://www.ibasecretariat.org/chron_ban_ ​list.php [accessed 9 June 2010]. Note:All the schools, colleges and universities besides hospitals including medical colleges are laden with asbestos despite the fact that people exposed to asbestos are prone to breathe in tiny asbestos fibres released into the air, which gets trapped in the lungs and cause inflammation and breathing problems. Exposure to asbestos may increase the risk of lung cancer, gastrointestinal and colorectal cancer and sometimes throat, kidney, oesophagus and gallbladder cancer. The white asbestos is highly carcinogenic even the World Health Organisation has reported that it causes cancer. It is a rare fibrous material that is used to make rooftops and brake linings. 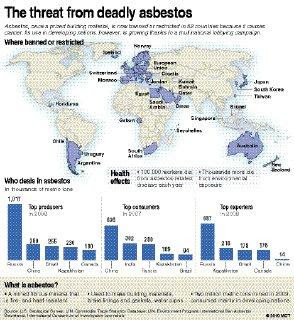 More than fifty countries have already banned the use and import of white asbestos. Even the countries that export it to India prefer not to use it domestically. But in our country, it is imported without any restriction. Canada and Russia are the biggest exporters of white asbestos. In 2007, Canada exported almost Ninety five percent of the white asbestos it mined and out of it forty-three percent was shipped to India. It is quite surprising that our country is openly importing huge quantity of a product, which causes cancer. This is despite the fact that safer and almost cheap alternatives to asbestos are available in the country. Instead of importing a hazardous material, it will be better if we spend some money in research and development and use environment friendly product. In view of the above, there is an urgent need for a total ban on the import and use of white asbestos and promote the use of alternative material. The International Labour Organisation, the World Health Organisation, the World Trade Organisation, the International Programme on Chemical Safety, the European Union, the Collegium Ramazzini, the International Social Security Association, the International Commission on Occupational Health all support a global ban on asbestos. Even the Supreme Court of India recognised in 1995 the hazards of asbestos in the case of Consumer Education and Research Centre (CERC) versus Union of India and more recently, in 2009 the Kerala Human Rights Commission noted that “exposing Indians to asbestos is a human rights violation”. * Take steps to reduce, with the aim of stopping, its import of asbestos from Canada (mined mainly in the province of Quebec) and from all other exporting countries. * Ban mining, manufacture, use and trade of asbestos in India. * Ensure the passing of the White Asbestos (Ban on Use and Import) Bill 2009 introduced in the Rajya Sabha in July 2009 (Bill No. XIII of 2009). * Revise its stand and support the listing of chrysotile asbestos in the PIC list of the Rotterdam Convention. * Ratify the ILO Convention on Asbestos. * Take concrete steps to address the occupational and safety concerns of workers employed in asbestos related industries; ensure compensation for workers harmed by asbestos and support a just transition for workers losing employment due to a ban on the mining, use in manufacture, and trade in asbestos. Backed by a global network of trade groups and scientists, the multibillion-dollar asbestos industry has stayed afloat by depicting Osasco and similar tragedies as remnants of a darker time, when dust levels were high, exotic varieties of the fire-resistant mineral were used, and workers had little, if any, protection from the toxic fibers. There is evidence that dangers persist: Perilous conditions have been documented from Mexico City to Ahmedabad, India. And yet, despite waves of asbestos-related disease in North America, Europe, and Australia, bans or restrictions in 52 countries, piles of incriminating studies, and predictions of up to 10 million asbestos-related cancer deaths worldwide by 2030, the asbestos trade remains alive and well. Asbestos is banned in the European Union. In the United States it is legal but the industry has paid out $70 billion in damages and litigation costs, and asbestos use is limited to automobile and aircraft brakes, gaskets and a few other products. The industry has found new markets in the developing world, however, where demand for cheap building materials is brisk. More than two million metric tons of asbestos were mined worldwide in 2009—led by Russia, China, and Brazil—mostly to be turned into asbestos cement for corrugated roofing and water pipes. More than half that amount was exported to developing countries like India and Mexico. Health officials warn that widespread asbestos exposures, much as they did in the West, will result in epidemics of mesothelioma, lung cancer, and asbestosis in the developing world. The World Health Organization (WHO) says that 125 million people encounter asbestos in the workplace, and the International Labor Organization (ILO) estimates that 100,000 workers die each year from asbestos-related diseases. Thousands more perish from environmental exposures. Dr. James Leigh, retired director of the Centre for Occupational and Environmental Health at the Sydney School of Public Health in Australia, has forecast a total of 5 million to 10 million deaths from asbestos-related cancers by 2030. The estimate is “conservative,” Leigh says. “If exposures in developing countries lead to epidemics extending further in time, the numbers would be greater.” Leigh’s calculation does not include deaths from asbestosis, a non-cancerous, chronic lung disease. Another study, by two researchers in New Delhi, suggests that by 2020, deaths from asbestos-related cancers could exceed 1 million in developing nations. Behind the industry’s growth is a marketing campaign involving a diverse set of companies, organized under a dozen trade associations and institutes. Backing them are interests ranging from mining companies like Brazil’s SAMA to manufacturers of asbestos cement sheets like India’s Visaka Industries. The largely uncharted industry campaign is coordinated, in part, by a government-backed institute in Montreal and reaches from New Delhi to Mexico City to the aptly named city of Asbest in Russia’s Ural Mountains. Last fall, the American Public Health Association joined the Collegium, the World Federation of Public Health Organizations, the International Commission on Occupational Health, and the International Trade Union Confederation in calling for a global asbestos ban. In 2009, a panel of 27 experts convened by the WHO’s International Agency for Research on Cancer reported, “Epidemiological evidence has increasingly shown an association of all forms of asbestos … with an increased risk of lung cancer and mesothelioma.” The panel also found there was new evidence that asbestos causes cancer of the larynx and the ovary. But the asbestos industry has signaled that it will not go away quietly. Promotion of pro-industry studies is joined by campaigns of political lobbying and ad buying to ensure that asbestos is freely marketed in fast-growing countries. Consider some of the events just this year: In a March 16 letter, the head of the Asociación Colombiana de Fibras, a chrysotile trade group in Bogotá, Colombia, asked World Bank president Robert Zoellick to “soften your position” on the compound, arguing that projections of 100,000 asbestos-related deaths a year were based on “old data.” (The bank announced last year that it expects borrowers to use asbestos alternatives whenever feasible.) In documents obtained in Colombia by ICIJ, the association boasts of creating a spinoff in Ecuador to try to shape government regulations and decries the emergence of the “international prohibitionist movement” against asbestos. “We have to start a wide campaign among all the chrysotile associations in the world to counteract [the movement], sending communications to the directors of the World Health Organization and International Labor Organization,” state the minutes of a 2008 board meeting. Fire- and heat-resistant, strong and inexpensive, asbestos—a naturally occurring, fibrous mineral—was once seen as a construction material with near-magical properties. For decades, industrialized countries from the United States to Australia relied on it for countless products, including pipe and ceiling insulation, ship-building materials, brake shoes and pads, bricks, roofing, and flooring. Ominous reports about the health effects of asbestos began appearing in Europe in the late 19th century. By 1918, American and Canadian insurance companies were refusing to cover asbestos workers because of rampant lung disease. In 1930, the ILO issued a warning: “All [asbestos] processes from extraction onwards unquestionably involve a considerable hazard.” In 1960, a South African pathologist confirmed a direct link between asbestos exposure and mesothelioma. And yet, uncontrolled use of asbestos only grew, peaking in the United States in 1973. By one estimate, 100 million Americans were occupationally exposed to asbestos during the 20th century. The first asbestos lawsuit against an asbestos insulation manufacturer in the United States was filed in 1966. Internal documents showing corporate knowledge of the mineral’s lung-ravaging properties began to surface, and by 1981 more than 200 companies and insurers had been sued. The following year, the nation’s biggest maker of asbestos products—Johns Manville Corp.—and two other defendants filed for bankruptcy protection in an effort to hold off the tide of litigation. From the 1960s through 2002, more than 730,000 people filed asbestos claims, resulting in damage payments and litigation costs of $70 billion, according to a 2005 study by the RAND Corp. Of this, $30 billion actually went to claimants. As the evidence against asbestos accumulated in the 1980s, the Scandinavian countries began to impose bans. But the biggest blow for chrysotile came in 1999, when the European Commission decreed that products made of white asbestos would be outlawed as of Jan. 1, 2005. The EU’s decision to ban was replicated by Chile, Australia, Japan, and Egypt, among other countries. Most flatly forbid use of asbestos, though a few still allow it in brakes and gaskets. Fifty-two countries eventually slapped restrictions on its use, including most of the developed world. Less hazardous but generally more expensive substitutes such as polypropylene fiber cement, aluminum roof tiles, and steel-reinforced concrete pipe have gained favor. Yet chrysotile continues to be mined and used heavily in some parts of the world; in 2008, raw fiber exports worldwide were valued by the United Nations at nearly $400 million. Russia is the world’s biggest producer, China the biggest consumer. But Canada—which uses almost no asbestos within its borders but still ships it abroad—is the primary booster, a role it assumed in the 1960s when the country’s mining industry in Quebec was threatened by studies tying the mineral to cancer. The federal and provincial governments together have given C$35 million over the past quarter-century to the Montreal-based Chrysotile Institute, a nonprofit group that promotes the “controlled” use of asbestos in construction and manufacturing. The Chrysotile Institute has received $1 million from the asbestos industry over the past five years, according to Godbout, who says he doesn’t know how much was contributed in the previous 20, before he became chairman. Documents obtained under Canada’s Access to Information Act by Ottawa researcher Ken Rubin indicate that the industry gave more than $18 million to the institute from 1984 through 2001, meaning its total contribution to Godbout’s group is probably around $20 million. The institute offers what it describes as “technical and financial aid” to a dozen sister organizations around the world. These organizations, in turn, seek to influence science and policy in their own countries and regions. Consider the situation in Mexico, which in 2007 used 10 times as much asbestos as its neighbor, the United States. Promoting chrysotile use is Luis Cejudo Alva, who has overseen the Instituto Mexicano de Fibro Industrias (IMFI) for 40 years. Cejudo says he is in regular contact with the Chrysotile Institute and related groups in Russia and Brazil, and gives presentations inside and outside of Mexico on the prudent handling of chrysotile. “If I knew that our industry kills people, that our products affect the population, I wouldn’t be here talking to you,” Cejudo says. “I am here because I have realized that many asbestos detractors exist, especially in Europe.” In the 1990s, he notes, IMFI members, along with their Canadian and American counterparts, agreed to stop selling asbestos to factories without adequate safety measures; this led to some plant closures. “We work hard with the government Health and Labor ministry representatives to create the regulations and to make constant visits to prove that the factories are following these regulations,” Cejudo says. Another sister organization is the Brazilian Chrysotile Institute, based in the state of Goiás, site of the country’s only asbestos mine. A prosecutor in the state is seeking dissolution of the institute, a self-described public interest group with tax-exempt status. The prosecutor charges in a court pleading that the institute is a poorly disguised shill for the Brazilian asbestos industry, which provides virtually all its budget. Among other things, the group helped the Brazilian government fund studies rigged to benefit the industry, the prosecutor alleges. Having inflicted “social damage stemming from [its] illegal practices,” the institute should pay one million reais (about $550,000) in damages and a fine of 5,000 reais ($2,800) for every day it remains open, the pleading says. In a statement to ICIJ, a spokesman for the institute denied the allegations, saying the group “ensures the health and security of workers and users, protection of the environment and [provides] information to society.” Public records show that the institute has taken in more than $8 million from asbestos companies since 2006. That a Brazilian prosecutor is even attempting to shut down the institute is unusual. Most if not all of the pro-chrysotile groups have friendly relationships with their host governments and appear to easily overpower public health advocates. In Russia,which produced one million metric tons of chrysotile in 2008, more than any country by far, Prime Minister Vladimir Putin pledged to assist the industry after a plea for help from a trade union chief. Putin “promised to support Russian producers of chrysotile, especially in situations where we find ourselves under political pressure at the international level,” Andrei Kholzakov, chairman of the union that represents workers at one of the country’s largest asbestos companies, Uralasbest, said in an April 2009 press release. Perhaps nowhere is the industry as strong as in India, the world’s second-largest consumer of asbestos, after China. There are more than 400 asbestos cement factories in the Indian state of Gujarat alone, concentrated in the city of Ahmedabad, and the national market is growing at the rate of 30 percent a year, due mainly to construction in poor, rural areas, where asbestos sheet is standard cover for homes.The Asbestos Cement Products Manufacturers Association (ACPMA) enjoys a “tight relationship” with federal and state politicians, says activist Madhumita Dutta. The state in which she lives, Tamil Nadu, owns an asbestos roofing materials plant, Dutta says, and there are similar arrangements in other states. “Things are a bit bleak,” she wrote in an e-mail to ICIJ. “The industry has grown and is expanding, their political clout getting stronger, their direct interventions in the government decision-making more apparent (through funding government studies), their propaganda more aggressive.” Government sources told ICIJ that the manufacturers’ association has received about $50 million from the industry since 1985, with annual allotments rising as anti-asbestos sentiment escalated. One of the group’s specialties is “advertorials”—faux news articles that extol the safety and value of asbestos products. The association’s annual budget now ranges from $17 million to $25 million, according to one member. The ACPMA says on its website that the use of chrysotile in manufacturing “is safe for the workers, environment and the general public.” Earlier this year, however, authorities brought four criminal cases against owners of a 48-year-old asbestos cement factory in Ahmedabad, Gujarat Composite Ltd., alleging egregious health violations. At least 75 employees of the company have developed lung cancer over the past decade. Though there are many uncertainties, researchers say that China appears poised for an explosion of asbestos-related illness in the not-too-distant future. Based on a formula developed by Antti Tossavainen with the Finnish Institute of Occupational Health—that one mesothelioma case occurs for every 170 tons of asbestos produced and consumed—at least 3,700 cases of the disease can be expected each year, not to mention thousands of cases of lung cancer, asbestosis, and stomach cancer. China has yet to see the level of disease experienced in Europe, the U.S. and other industrialized parts of the world, experts say, because per capita consumption of asbestos remained low into the 1970s. That's no longer true, as China is now the world’s biggest user of the mineral. Takala, director of the European Agency for Safety and Health at Work, estimates that 10,000 to 15,000 Chinese will die of asbestos-related ailments each year by 2035. The country has about 1,000 asbestos mines and production facilities, one million asbestos workers, and annual consumption of more than 600,000 metric tons of chrysotile. No country has defended chrysotile as vigorously, and for as long, as Canada. When the U.S. Environmental Protection Agency issued a rule banning asbestos in 1989, the government of Canada participated in an industry lawsuit that overturned the rule. When France banned asbestos a decade later, Canada teamed up with Brazil in an unsuccessful World Trade Organization challenge. And when a United Nations chemical review committee recommended in 2008 that chrysotile be listed under Annex III of the Rotterdam Convention—a treaty that requires exporters of hazardous substances to use clear labeling and warn importers of any restrictions or bans—Canada, India, and a few other nations kept the recommendation from winning the unanimous support it needed to pass. Canada today is the world’s fifth largest producer of asbestos and its fourth largest exporter, shipping $97 million of raw fiber overseas in 2008. All this comes from just two mines, both located in Québec. The Chrysotile Institute says the industry accounts for about 700 direct and 2,000 indirect jobs—hardly an economic juggernaut. But it survives despite mounting criticism: Both the federal and provincial governments have been besieged by letters from prominent academics, physicians, and others protesting Canada’s export of chrysotile. In a statement to ICIJ, the Quebec Ministry of Natural Resources made its case: “There are no valid reasons to halt chrysotile export since it can be used safely. [D]eveloping countries are in great need of this kind of material (as we were some years ago) to build good infrastructures. Furthermore, substitutes to chrysotile have not yet been proven to be safer.” In addition to funding the Chrysotile Institute, the ministry has given C$748,000 since 2004 to the Société Nationale de l’Amiante, an asbestos research group. No longer active, the group relocated its office to the ministry, which is in the process of settling its “past commitments and responsibilities,” a government spokesman said. Fine for export, perhaps, but not for domestic use. In 2009, Canada sent nearly 153,000 metric tons of chrysotile abroad. More than half went to India; the rest went to Indonesia, Thailand, Mexico, Sri Lanka, Pakistan, and the United Arab Emirates. At home it was a different story: Canada used only 6,000 tons domestically in 2006, the last year for which data are available. Canadian officials seem determined to boost production: The Quebec Ministry of Economic Development, Innovation and Export Trade is considering a C$58 million loan guarantee to save the floundering Jeffrey Mine. The mine’s owner has announced plans to ship 200,000 tons of chrysotile per year to Asia if the money comes through. On March 10, David Bernstein stepped up to the podium at the Society of Toxicology’s annual meeting in Salt Lake City, Utah, and announced the results of his latest study. An American-born toxicologist based in Geneva, Bernstein began researching chrysotile in the late 1990s at the behest of a mine operator in Brazil. He was now reporting that rats exposed to chrysotile asbestos for five days, six hours a day, had shown no ill effects whatsoever. Rats exposed to brown amosite, a type of amphibole, hadn’t fared so well. The chrysotile fibers were cleared quickly from the animals’ lungs and caused “no pathological response at any point,” even though the exposure level was 50 percent higher than that for amosite, Bernstein said. The fibers have very different appearances under magnification. Chrysotile fibers look like ultrathin, rolled sheets; amosite and other amphiboles look like solid rods. The sponsor of the as-yet unpublished study was Georgia-Pacific Corp. of Atlanta, which once made a ready-mix joint compound—a gooey white substance used to seal joints between sheets of drywall—that contained 5 percent chrysotile. Georgia-Pacific has been sued in the United States by a number of mesothelioma victims who claim they were exposed to asbestos while sanding the dried compound. Bernstein’s latest study, done in conjunction with Georgia-Pacific’s chief toxicologist, Stewart Holm, could be good news for the company. Bernstein is the most active of a dozen or so industry-backed scientists who have helped fuel the asbestos trade by producing papers, lecturing, and testifying on the relative safety of chrysotile. The industry has spent tens of millions of dollars funding their studies, which have been cited some 5,000 times in the medical literature as well as by lobby groups from India to Canada. Bernstein’s work alone has been cited 460 times. He has been quoted or mentioned in Zimbabwe’s Financial Gazette, Hong Kong’s South China Morning Post and other publications around the world. His curriculum vitae suggests that he’s been a one-man road show for chrysotile, giving talks in 19 countries since 1999. Among his stops: Brazil, China, Colombia, India, Indonesia, Korea, Mexico, Russia, South Africa, Thailand, and Vietnam. The industry paid for all of his travel, Bernstein told ICIJ in an interview. Indeed, all of Bernstein’s work on asbestos has been underwritten by the industry, and he has become its principal defender at scientific meetings and in other venues. Bernstein says he has no idea how much all his studies have cost and emphasizes that, in any case, most of the money goes to the laboratory in Basel, Switzerland, where the animal experiments are performed. Court documents show that one sponsor, Union Carbide, paid $400,623 for work by Bernstein in 2003 and 2005. In an interview in his hotel lobby the day before his presentation in Salt Lake City, Bernstein said that Georgia-Pacific in no way influenced his chrysotile research, nor have any of his other corporate sponsors. “I would work for any group,” Bernstein explained. “I have no limitations. Unfortunately, the groups that don’t like this work don’t ask me.” He decried the hyperbole surrounding chrysotile—“It’s a hysterical thing; it doesn’t come from science”—and said he doesn’t believe the fragile white fibers cause mesothelioma. They could cause lung cancer, he said, if exposures were extremely high. The relevance of Bernstein’s rat experiments to humans is contested by fellow researchers. For example, an expert panel assembled by the U.S. Agency for Toxic Substances and Disease Registry concluded that rodents clear short asbestos fibers from their lungs about 10 times faster than do people. Bernstein’s animals, moreover, were exposed over a relatively brief period of time. Many workers inhale asbestos over months or years, not days. “Not everyone exposed, even heavily, will necessarily develop disease, but data in the scientific literature show that as little as one day of exposure in man and animals can lead to mesothelioma, and a month or less of exposure in man doubles the risk of lung cancer,” says Dr. Arthur Frank, a physician and professor at the Drexel University School of Public Health in Philadelphia. If Bernstein is chrysotile’s scientific ambassador, then 92-year-old J. Corbett McDonald is its longest-tenured champion. He is the author of three dozen scientific papers on chrysotile, and his work has been cited in the medical literature nearly 1,500 times. In a telephone interview, McDonald said he was approached by the Canadian government in 1964to study asbestos miners and millersin Quebec; he, in turn, appealed to the Quebec Asbestos Mining Association for funding, which it agreed to provide. The impetus for the research, McDonald said, was a paper by Dr. Irving Selikoff of New York’s Mount Sinai School of Medicine reporting that insulation workers with relatively light exposures to asbestos were dying of mesothelioma and other cancers at strikingly high rates. Forty-five years later, McDonald remains resolute in his defense of asbestos. He says there is “very strong evidence” that contaminants in chrysotile, and not the chrysotile itself, caused excesses of mesothelioma among the Quebec workers. The toxic agent, he suspects, was tremolite, a type of amphibole. McDonald insists that his work was never influenced by the asbestos industry. Indeed, he wasn’t sure how much its leaders even cared about his work. “It used to worry us a bit that they took so little interest in the results,” he says. McDonald’s tremolite theory—rebutted by studies of textile workers exposed to almost pure chrysotile, and just this year, a study of workers at a brake-lining factory—follows a pattern that Dr. David Egilman, a physician and clinical associate professor at Brown University in Providence, Rhode Island, calls ABC: anything but chrysotile. In fact, some researchers and defense lawyers have argued that mesothelioma could be triggered by a polio vaccine contaminated with a monkey virus. “Like the tobacco industry, they’ve been successful at manipulating scientific theories to confuse the public about the real risks of using asbestos,” says Egilman, who, like Frank and Castleman, testifies on behalf of plaintiffs in asbestos lawsuits. Bernstein’s and McDonald’s studies have proved helpful to an industry under growing pressure to disband. Amphiboles such as the virulent blue crocidolite, which killed miners in South Africa for nearly two centuries before the nation imposed a ban in 2008, are virtually never encountered today. There are obvious economic incentives, skeptics say, to blame most of the asbestos disease in the past 50 years on obscure types of the mineral and imply that chrysotile, which accounts for 95 percent of all the asbestos ever used, is relatively benign. Several key criticisms have been leveled at the researchers who defend chrysotile. They tend, for example, to focus on mesothelioma—the disease that comes up most often in litigation because it is considered a marker of asbestos exposure—and ignore lung cancer, which occurs more frequently. ”Chrysotile is just as potent [as amphiboles] in terms of lung cancer, and it might even be more potent,” says Peter Infante, former director of the Office of Standards Review at the U.S. Occupational Safety and Health Administration. They fixate on the amount of time chrysotile fibers spend in the lungs, failing to acknowledge that the fibers can do a figurative hit-and-run on cells, damaging DNA and precipitating cancer. And they buy into what WHO consultant Castleman calls the fallacy of controlled use—the idea that employers in the developing world are serious about dust suppression and ventilation. Despite the reassuring studies and the million-dollar marketing efforts, the asbestos industry faces stiffening headwinds. The number of countries imposing bans or restrictions continues to climb, and groups of health and labor activists have sprung up in China, Brazil, India, and other high-use countries. The government of Canada, long considered a leader on environmental and health matters, has come under withering attack for pushing exports. Jim Morris writes for the Center for Public Integrity, from where this article is adapted. Ana Avila in Mexico City, Dan Ettinger in Washington, D.C., Murali Krishnan in New Delhi, Roman Shleynov in Moscow, and Marcelo Soares in Sao Paulo contributed to this article. As part of the season of programmes Dangers in the Dust: inside the Global Asbestos Trade, Steve Bradshaw meets scientists on both sides of the debate. Some experts warn that by 2030 asbestos could be linked to millions of deaths. Yet, despite an international outcry, its use continues across much of the world. The industry says it now uses only a less hazardous form of the mineral called white asbestos or chrysotile, which can be safely controlled and that lives lost should be blamed on varieties now banned . Many scientists however, insist all forms of asbestos may cause cancer, and continuing exports could seriously prolong the epidemic. In an exclusive worldwide investigation, the BBC and the International Consortium of Investigative Journalists (ICIJ) reveal the truth about asbestos use across four continents. The investigation shows that a global network of industry groups has spent millions of dollars in public and private money since the mid-1980s to keep asbestos in commerce internationally. Dangers in the Dust is being rolled out in a series of stories across the BBC's international services, and through ICIJ’s partner publications worldwide. Canada mines and exports white asbestos or chrysotile to developing countries such as India. The industry says that white asbestos can be used safely. But a scientific controversy rages around the continued use of white asbestos, and the World Health Organisation says the most efficient way to eliminate asbestos-related diseases, such as lung cancer and asbestosis, is to stop using all types of asbestos. The use of white asbestos has been banned - or is subject to stringent restrictions in more than 50 countries - amid fears that it is too dangerous to public health. But in many parts of the developing world, its use is growing. Lauded for its cheap and durable qualities, white asbestos is a popular product in places like India, where there is a strong demand for affordable housing. One Planet comes from Ahmedabad in western India, a city where asbestos is commonplace. Presenter Mike Williams visits a shanty town made of broken bits of asbestos sheeting, and meets the factory workers suffering breathing problems. He hears state government officials boast there is no asbestos in the region, before changing their mind, and he tries to speak with the boss of one of the city's biggest asbestos product manufacturers. Steve Lee is living with the incurable cancer, mesothelioma. It is caused by exposure to asbestos. Despite his illness, Steve has continued to run and he has lived for longer than his doctors expected. Professor Julian Peto, of the London School of Hygiene and Tropical Medicine, tells Claudia Hammond how it was discovered that asbestos is so dangerous to health. He explains why currently the UK has more deaths from asbestos-related diseases than any other country. In the early 20th Century, Turner Brothers Asbestos was the largest asbestos producer in the world. It owned mines in Canada and southern Africa, as well as factories in the north of England which processed the mineral into a spun yarn. Then, in 1924, an asbestos spinner named Nellie Kershaw died and things began to change. NEW DELHI — Every day, the swirling waters of the Arabian Sea bring misery to Alang, the world's largest shipbreaking yard, in western India's Gujarat state. The Indian government is aware of the risks but loath to interfere: The men need jobs, and India's economy, among the world's fastest-growing, needs secondary steel from the beached vessels. "Reclamation and recycling," said Pravin Nagarsheth, the president of the Iron Steel Scrap and Shipbreakers Association of India, "is a highly lucrative business." One hundred-twenty miles north of Alang, workers at hundreds of dusty asbestos factories in the city of Ahmedabad face similar hazards in the name of economic development: lung cancer, asbestosis and a rapacious malignancy called mesothelioma, usually found in the chest cavity. In this case the end product is asbestos sheet, widely used in construction. Valued for its heat and fire resistance, asbestos was once widely used worldwide, but 52 countries ban or restrict it now. The use of the mineral is banned entirely in the European Union. In the United States — where it's blamed for some 200,000 deaths and has cost the industry $70 billion in damages and litigation expenses — asbestos use is limited to a handful of products, such as automobile brakes and gaskets, and rarely used even in those. In India, however, asbestos use is booming. The country is now the world's second largest asbestos market, behind only China, consuming nearly 386,000 tons in 2008. The industry generates more than $850 million a year in revenue, and it directly employs 300,000 people; indirectly, it supports as many as 3 million more. Backed by a powerful lobby, asbestos use in India has risen by 83 percent since 2004, according to government figures. Given evidence of poor workplace safety and weak regulations, such widespread use could prove disastrous, health experts said. One study by two New Delhi researchers suggests that deaths from asbestos-related cancers could reach 1 million in developing nations by 2020. "The industry is using its economic and political power in a way that's allowing it totally unrestrained growth," said Barry Castleman, a U.S. environmental consultant who advises the World Health Organization. 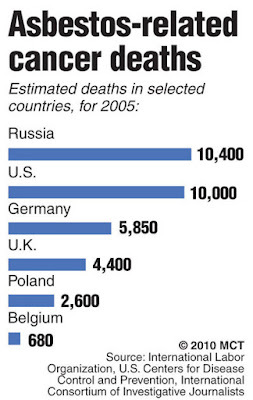 "We can only expect untold numbers of preventable deaths to occur as a result." According to recent estimates by the Asbestos Cement Products Manufacturers Association, a New Delhi-based industry organization, the Indian asbestos market grew by more than 30 percent just in the past year, primarily because of demands in the country's rural sector. "The asbestos market — despite being a health hazard — has grown because it serves the market for the poor," said Gopal Krishna of the Ban Asbestos Network of India. "And that market is growing at a tremendous pace. So nobody has the time for complaints." In India, asbestos products carry no health warning labels and trade unions have no mandate to prevent asbestos-related disease at workplaces. Although researchers around the world have linked lung cancer and other diseases with exposure to the widely used white, or chrysotile, asbestos, the powerful Asbestos Cement Products Manufacturers Association — funded by 12 asbestos companies, as well as by the Canada-based Chrysotile Institute — concedes nothing. "That lung cancer deaths have been caused by inhaling asbestos fiber has not been conclusively proved in India," said John Nicodemus, the association's executive director. "This is the handiwork of groups like BANI. The government's stand on asbestos is very clear. It has yet to receive proof of the product being a health hazard." The manufacturers association and others contend that chrysotile asbestos is less toxic than blue or brown forms of the mineral, which no longer are used. Nonetheless, many health experts say chrysotile asbestos can be deadly. Nicodemus refused to divulge details of the association's funding, but senior government officials say it's received $50 million since it was founded in 1985. A. Modi, the president of an asbestos manufacturing company that's affiliated with the association, told the International Consortium of Investigative Journalists that association member companies contribute 2 to 3 percent of their revenue to the lobby group for "promotional activities in India that revolve around advertising promotions to counter baseless allegations by Ban Asbestos Network India (and) legal and promotional activities that (are) mostly in rural India." This means that at current exchange rates, the association receives the equivalent of $8 million to $13 million per year. It spends some of this money on "advertorials," at up to $34,000 apiece, in mass-circulation Indian daily newspapers, ostensibly to counter what it terms disinformation about the effects of asbestos. Government officials say the association also spends significant amounts on lobbying and training — mostly in Canada and Russia — for its staffers. Its already sizable budget is expected to increase as industry output grows — possibly to 600,000 tons a year — to meet the demand for asbestos-sheet roofing in India's villages. The manufacturers association's lobbying activities were part of a detailed discussion on hazardous minerals during a spirited meeting at the Ministry of Mines in April, when a host of scientific and public interest groups opposed demands for the increased use of asbestos. At the meeting, officials told the International Consortium of Investigative Journalists, representatives of BANI and the National Institute of Miners' Health argued for an asbestos ban. Representatives of asbestos companies, in turn, demanded proof that asbestos causes lung diseases and dismissed the idea of a ban. 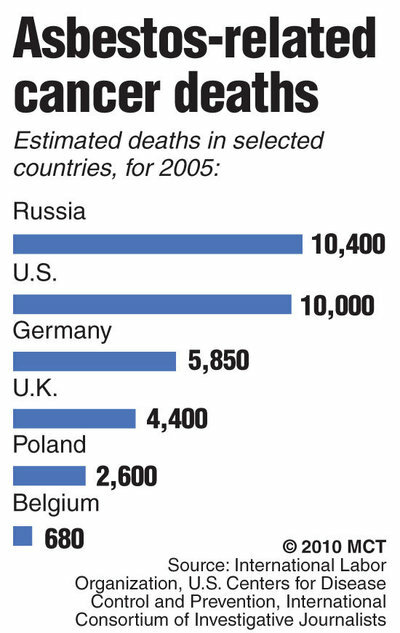 When public health advocates produced global figures to argue their case, the industry officials replied that such figures reflected deaths in other countries and not in India, where they say chrysotile use under "controlled conditions" poses little risk. The companies, however, rarely provide the working conditions and safety equipment to protect their employees from the dangers of asbestos, experts say. Most of the asbestos used in India comes from Russia or Canada. Despite the rapid increase in usage across India, little mention is made of the potential health effects. For example, a newly released environmental impact assessment guidance manual for asbestos-based industries — with a foreword by Indian Environment Minister Jairam Ramesh — has no details about the alarming rise in asbestos-related diseases worldwide or countries that have banned the product. Those who follow the industry aren't surprised. The first official records on the dangers of asbestos became public in India only in 2008, when BANI's Krishna, who was then a young, unknown activist, demanded documents under the Right to Information Act, India's freedom of information law. For the Indian public, reporting on asbestos remains scarce, however. Experts say this is primarily because the states and union territories have no mechanism to prove that lung cancer deaths and other skin diseases are being caused by asbestos exposures. As a result, the Indian asbestos industry is insulated from the movement to ban asbestos globally. The lack of official attention has dire consequences for tens of thousands of workers likely to succumb to asbestos-related diseases, health experts warn. At one company in Ahmedabad — Gujarat Composite Ltd. — at least 75 workers have been diagnosed with lung cancer in the past 10 years, out of a work force of about 1,000, according to nongovernmental activists in Ahmedabad who are working on asbestos-related diseases. At least 20 of those have died, they said. "No one listened to our repeated complaints of breathing troubles and skin irritation," said Rues Muthuswami Munian, who's suffered from the disease for nearly a decade. He and other sick workers say the company fired them and offered virtually no compensation, prompting them to file a complaint with the local police over conditions at the company. Shorn of money, they're dependent on monthly handouts from a few aid organizations. Representatives of Gujarat Composite are the target of four criminal complaints that the state Labour and Employment Department filed in March. The complaints accuse the company of lacking safety records, failing to conduct medical exams of workers and refusing to provide inspectors with a registry of its workers. "There were no records kept of the fibers floating in the atmosphere," one complaint reads. Gujarat Composite officials declined repeated requests for an interview. The U.S.-based company Johns Manville held a stake in the 48-year-old factory when it was called Shree Digvijay Cement Co. and expressed dismay about its hygiene decades ago, according to documents obtained by the International Consortium of Investigative Journalists. In a confidential 1977 memorandum, for example, a Johns Manville official wrote, "The Indian Government Environmental Division has been recently tightening dust emissions and Shree has been told to either shape up or close down with their management liable for jail sentences. Their present operation is just indescribably poor. The wet end of the pipe machines is like 'London fog' with fiber floating all over from the fiber bins." Johns Manville held 10 percent of Shree Digvijay's stock until at least 1983. In 1997, about a year after it acquired the factory, Gujarat Composite began subcontracting with two privately owned companies. In January, responses to requests by a nongovernmental organization filed under the Right to Information Act suggested that more than 1,000 workers at the two firms toiled under dangerous conditions. "The saddest part of the story is this: The state government knows what is happening, yet no action has been taken on these two companies," said Raghunath Manwar of the Ahmedabad-based Occupational Health and Safety Association, which advocates for asbestos victims. "The environment is lethal," said Dheemant Badia, an Occupational Health and Safety Association trustee. "These workers work in a death zone because there is no practice of measurement of airborne asbestos-fiber dust." Gujarat's Directorate of Industrial Safety and Health has routinely received complaints about Gujarat Composite but, critics charge, has turned a blind eye. In the majority of Indian states and territories, asbestos is considered an essential ingredient of growth. In the southern state of Andhra Pradesh, a pro-asbestos agenda is being pushed by one of its members of Parliament, Gaddam Vivekanand, who reportedly controls 25 percent of India's asbestos production through his ownership of seven factories across the country. An eighth will open this year in eastern Orissa state. The ubiquitous nature of the fiber is best demonstrated in western Maharashtra state, which is filled with asbestos factories in places such as Mumbai, Pune and Kolhapur. The Maharashtra Pollution Control Board acknowledges the mounting number of lung diseases in the state in its annual reports, but it's taken no action to make the state asbestos-free. Beneath the growing debate, some experts note, lies the fact that India remains a country in which an estimated 450 million people live below a government-stipulated poverty line. In such an environment, the chances of factories maintaining the proper safety and health standards may be dim indeed. Castleman, the environmental consultant, said it was reasonable to expect hundreds of thousands of asbestos-related deaths before India would react. "I'm hard-pressed to point to any sign of success that activists and public health people have had over there," he said. Asha Gupta, a lawyer who represents asbestos victims in Gujarat, said that companies at least needed to provide safety gear to those who were working in such hazardous conditions. "Otherwise, workers will continue to fall sick and, eventually, die a slow, painful death." WASHINGTON — A global network of lobby groups has spent nearly $100 million since the mid-1980s to preserve the international market for asbestos, a known carcinogen that’s taken millions of lives and is banned or restricted in 52 countries, the International Consortium of Investigative Journalists found in a nine-month investigation. Backed by public and private money and aided by scientists and friendly governments, the groups helped facilitate the sale of 2.2 million tons of asbestos last year, mostly in developing nations. Anchored by the Montreal-based Chrysotile Institute, the network stretches from New Delhi to Mexico City to the city of Asbest in Russia’s Ural Mountains. Its message is that asbestos can be used safely under “controlled” conditions. As a result, asbestos use is growing rapidly in countries such as China and India, prompting health experts to warn of future epidemics of lung cancer, asbestosis and mesothelioma, an aggressive malignancy that usually attacks the lining of the lungs. The World Health Organization says that 125 million people still encounter asbestos in the workplace, and the United Nations’ International Labor Organization estimates that 100,000 workers die each year from asbestos-related diseases. Thousands more perish from exposures outside the workplace. Dr. James Leigh, the retired director of the Centre for Occupational and Environmental Health at the Sydney School of Public Health in Australia, has forecast a total of 5 million to 10 million deaths from asbestos-related cancers by 2030, an estimate he considers conservative. The asbestos industry, however, has signaled that it will fight to protect sales of raw fiber and finished products such as asbestos cement roofing and water pipes. Among its allies are industry-funded researchers who have contributed hundreds of articles to the scientific literature claiming that chrysotile — white asbestos, the only kind sold today — is orders of magnitude less hazardous than brown or blue asbestos. Russia is the world’s biggest chrysotile producer, China the biggest consumer. McDonald’s sanguine view of chrysotile assumes that employers provide proper dust controls, ventilation and protective equipment for workers, but public health experts say that such measures are uncommon in the developing world. “Anybody who talks about controlled asbestos use is either a liar or a fool,” said Barry Castleman, an environmental consultant based near Washington who advises the WHO on asbestos matters. Fire- and heat-resistant, strong and inexpensive, asbestos — a naturally occurring fibrous mineral — once was seen as a construction material with near-magical properties. For decades, industrialized countries from the United States to Australia relied on it for countless products, including pipe and ceiling insulation, shipbuilding materials, brake shoes and pads, bricks, roofing and flooring. In the early 20th century, reports of the mineral’s lung-ravaging properties began to surface. By the century’s end, millions of people were sick or had died from asbestos exposure, and billions of dollars in compensation had been paid to claimants. Ninety-five percent of all the asbestos ever used has been chrysotile. This sordid history, however, hasn’t deterred the asbestos lobby, whose longtime leader is Canada. The federal government and the government of Quebec, where chrysotile has been mined for decades, collectively have given 35 million Canadian dollars to the Chrysotile Institute, formerly known as the Asbestos Institute. Canada uses little asbestos domestically but it sent 168,000 tons abroad last year; more than half of that went to India. Canada has fought to keep chrysotile from being listed under Annex III of the Rotterdam Convention, a treaty that requires exporters of hazardous substances to use clear labeling and warn importers of any restrictions or bans. Despite mounting pressure from public health officials to stop asbestos exports, Canadian officials continue to defend the industry. “Since 1979, the government of Canada has promoted the safe and controlled use of chrysotile and our position remains the same,” Christian Paradis, the natural resources minister in Canada’s conservative government and a former president of the Asbestos Chamber of Commerce and Industry, told the International Consortium of Investigative Journalists in a written statement. Amir Attaran, an associate professor of law and medicine at the University of Ottawa, calls the government’s position unconscionable. “It’s absolutely clear that (Prime Minister) Stephen Harper and his government have accepted the reality that the present course of action kills people, and they find that tolerable,” Attaran said. The Chrysotile Institute’s president, Clement Godbout, said his organization’s message had been misinterpreted. The institute is a purveyor of information, Godbout emphasized, not an international police agency. “We don’t have the power to interfere in any countries that have their own powers, their own sovereignty,” he said.